What does public service really mean in Papua New Guinea? A Member of Parliament is elected to serve his constituents, and is paid handsomely to do it; a minimum of K330,000 a year in take home pay, according to Madang MP Bryan Kramer. For this princely sum, surely an electorate should expect their member will spend every working hour striving to support their struggles and advance their interests? After all, K330,000 a year is 45 times the national minimum wage and more money than most people could even dream of earning. If an MP is given the added honour of serving as a Minister of State his take home pay is increased, to reflect the added duties and responsibilities, to a cool K546,000 per year. After all, said Minister now has not only the weight of responsibility of serving his own constituents, he now has responsibility for a whole government department, hundreds of staff and numerous local, national and international obligations. No time here, clearly, for personal business interests, nor should there be. After all, that is why a Minister is paid so handsomely, not only to work tirelessly for his constituents, his departmental staff and the Nation, but also to recognise the lost opportunities to pursue his own commercial interests. So how is it then that a senior government minister, one so burdened by public responsibility and so richly rewarded by hard working members of the public through their taxes, could have the time to register seven new businesses in less than three years? Especially seven new businesses in sectors as diverse as travel, security, transport, health, real estate and education? This, it seems, is just what Minister for the Environment, Conservation and Climate Change, John Pundari has been able to do. Starting in February 2014 and continuing through to November 2016, Pundari registered seven new companies. Network map: The seven new companies registered by John Pundari since February 2014. In an earlier series of investigative reports, PNGi exposed the substantial business network the current Prime Minister has nurtured over the past decades; it is a model that it seems others are following. 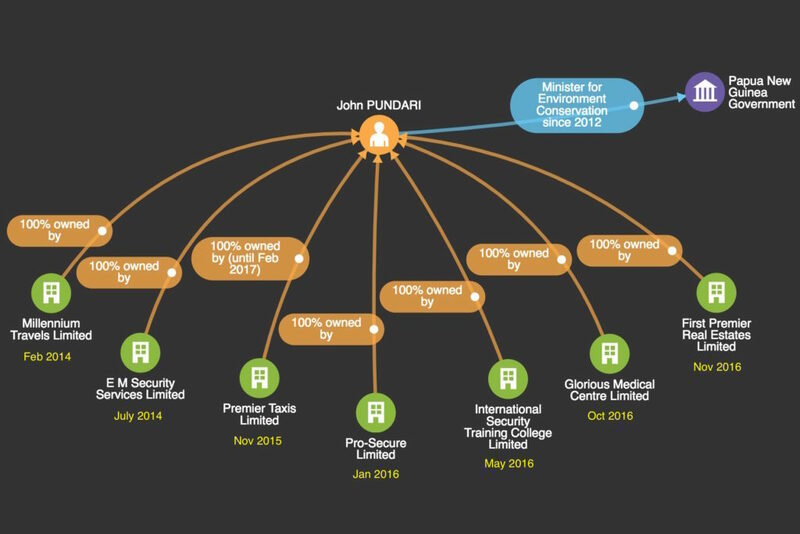 John Pundari’s seven new businesses are not, after all, the only ones he owns. In total there are some eighteen companies that Pundari currently either owns outright or jointly owns. It can be argued this is not what was intended by those who framed our Constitution, even if it is within the limits of what is allowable under the law as currently written. At the heart though is a more philosophical question: Is a Minister paid by the tax payer to serve the public’s interests alone, or should Ministers, MPs and other leaders be free to pursue their own business interests while being handsomely rewarded for their public service?